Once a year, Dom runs an exclusive three-day residential seminar, or ‘Retreat’, for ambitious professional service firm entrepreneurs. This event, capped to 14 delegates, is for forward-looking owner managers of professional service firms (or those seriously considering starting-up such a venture). During the event, you will explore in some detail the action steps required to build value into your business – such that it could, ultimately, provide you with the strategic option for a life-changing, value-realisation-event and personal financial freedoms beyond. What makes these events special? Getting from where you are now to a point where your professional service business has such life-changing value is, self-evidentially, not an easy process. To build such a firm requires (a) pragmatic knowledge of where value lies and the systems required to develop such success, (b) the inclination/motivation to tread the ‘hard miles’ of this value-build journey, and, (c) access to experienced advice/support en route. Uniquely, these seminars address all three critical areas – specifically targeted at entrepreneurs of professional service companies (consulting, financial, engineering, legal, design firms etc). In an enjoyably-intense working setting, Dom will cover the core aspects of his experience (singleton start-up-to-sale of Moorhouse for c. £20m in under five-years) as covered in the Five-Year Entrepreneur Series. Additionally, you will benefit from the impressive calibre, and experience, of fellow business leaders. Capped to an exclusive working group of 14, Dom will guarantee a high-energy, motivating event that will leave you raring to get back to your new/revised business plans. Finally, harnessing the forum of like-minded attendees, the Retreat will also initiate a professional mutual-support construct … enabling you to derive on-going support/advice in the months and years ahead from this select peer group. To spend three ‘quality’ days working on your business (as opposed to ‘in your business’) setting goals and action plans that could demonstrably impact the future direction of your company. To hear from Dom and other subject-matter experts as to where value lies in a professional service business – such that all your future decisions are based on this grounded knowledge. To rejuvenate your motivation for building your company. To build a network of peer entrepreneurs working in the same sector and to benefit from this professional support group way beyond the dates of the Retreat. To drastically increase your chances of having a business of value and to drastically decrease the time it takes to get there! The next event is scheduled for: Retreat 06: Wednesday 27 June – Friday 29 June. Please communicate your interest if you would like to secure a place. 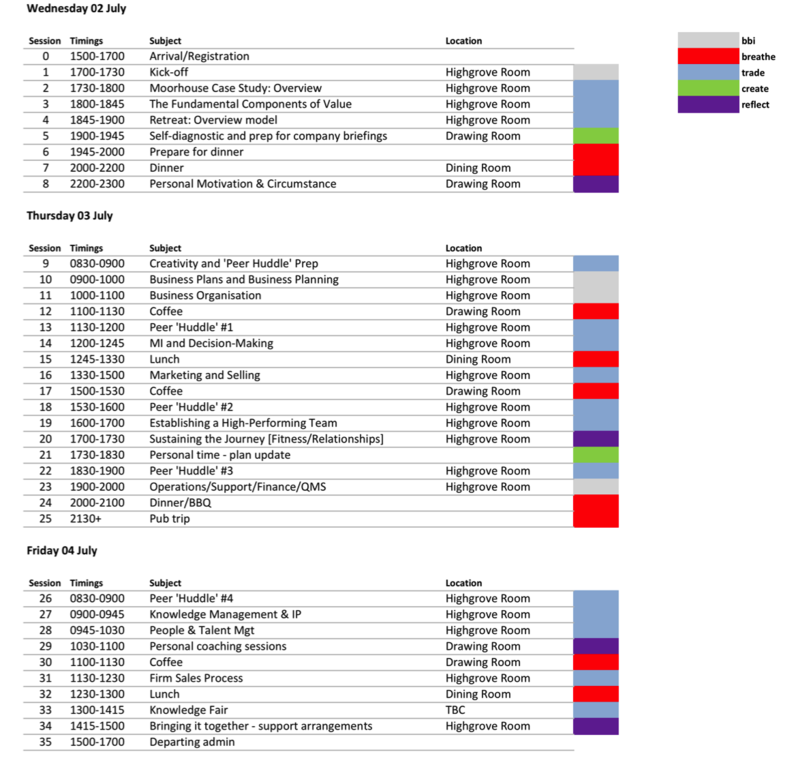 The Retreats run from 12pm on the Wednesday with formal commencement at 2pm and conclude at 3.30pm on the Friday. The Retreats are held at the luxury Homewood Park Hotel located just outside Bath, UK. There are excellent transport links from M4 (driving), Bath Railway Station (train) and Bristol Airport (flying). The full price of the Five-Year Entrepreneur ‘Retreat’ is £3,200 plus VAT*. In addition to the seminar fee, this will include full accommodation, dining (breakfast, lunch and dinner) and the c. 500 page resource folder. On expression of interest, you will be included in the planning for the next presentation. Once a date is confirmed, then full payment is required and cancellation charges are as below. Each event is capped to 14 places; if you have an enquiry or wish to join an event’s registration/waiting list please contact Dom here. If you attend this event and do not subsequently consider it a positively-pivotal moment in the progression of your business plans, and wealth-creation ambition generally, Dom will refund the cost of the event in full … no questions asked.